Apple was the first mobile phone maker that introduced fingerprint security to their smartphones with iPhone 5s. Ever since that, we have seen several mobile phone makers to introduce a fingerprint sensor but none has been able to master the efficiency and quickness of Touch ID enabled smartphones. Now, Apple through their latest patent granted on February 14, 2017 have explained how they plan on introducing with iPhone 8, a fingerprint detection capabilities without a dedicated sensor. U.S. Patent No. 9,570,002 titled, “Interactive display panel with IR diodes”, describes a touch display incorporating micro-LED sensing technology. This is different from the more widely accepted active matrix hardware seen on most mobile devices. With the ability to replace the capacitive sensor components in the iPhones by strategically placing infrared light emitters and sensors, will ensure that most of the hardware remains the same. This technology is part of the IP acquired through LuxVue purchase that was done by Apple in 2014. 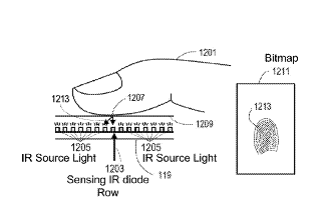 The patent further goes on to explain that the micro-LEDs can be used as substitute for standard capacitive touch arrays. Due to the small size of IR diodes, they can be embedded into a display substrate alongside RGB LEDs or on a microchip mounted to the substrate. With iPhone 8 rumored to feature an edge to edge display, this design aligns well with the rumors and we can expect a bang on brilliant iPhone from Apple.